The airspaces extension gives access to airspace information of a large number of countries. Airspace information is updated regularly, is automatically loaded, and does not need to be managed by you. But it is also possible to personalise the information by loading a custom airspaces file. Of course, you can completely switch off certain airspace classes. The maximum controlled altitude can be set. 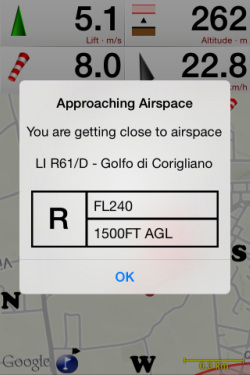 This reduces clutter on the map by not showing irrelevant airspaces whose low limit is above a preset altitude. 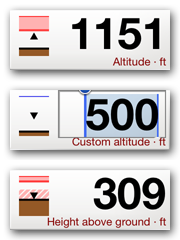 At any time, your vertical position with respect to airspaces is shown on the left of the Altitude element. The little arrow shows your position and whether you are going up or down. Colored areas show the airspaces above, below, and enclosing you. The color is the same as on the map, according to the settings that you made. The depicted vertical range is 1000 meters. So in the case on the left, you are about 150 meters below an airspace. If the airspace is striped, as shown on the bottom left, then you are not flying in it, but next to it. You are then within the warning distance of 500 meter (by default) horizontally from the airspace. A single line at the top indicates that there are (other) airspaces somewhere above you. These can be more than 500 meter above you. If enabled, Flyskyhy will warn when approaching and entering controlled airspaces. A loud alarm tone sounds, and a pop-up shows which airspace you are about to violate. The pop-up disappears automatically after a couple of seconds. Warnings are given when coming close to an airspace from the side, or when approaching it from below. The warning distances are fully configurable. A warning is also given when you are about to overfly an airspace, regardless how far you are above it. This will prevent you from later sinking into it. Touching any spot on the map will show the airspaces that are in effect at that location. That way, you can always get an overview of what is awaiting you further on your route. Besides the official airspaces, which are updated and loaded automatically, it is also possible to load your own custom airspaces. The custom airspaces need to be available in an OpenAir formatted file. Make sure that the file has a .txt extension, and then open that file on the iPhone in any supported way, for example as attachement to a mail, or from a file organiser app. When you open the file, iPhone will ask you to open it in Flyskyhy. You can load one custom airspace file; if you load a new one, the old one will be overwritten. 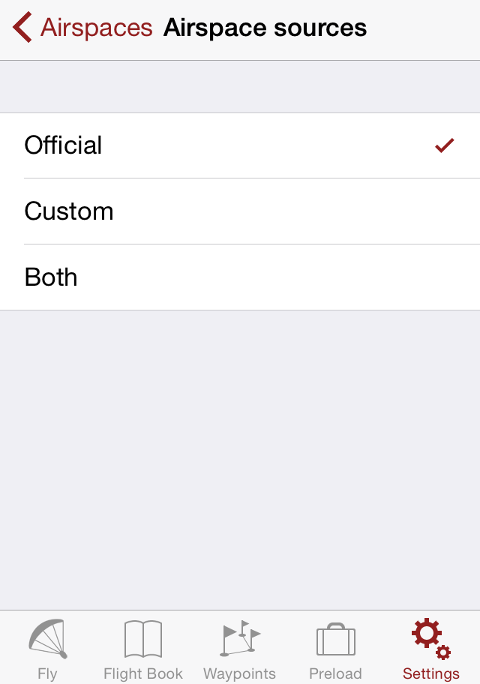 In the Settings you can choose whether you want to see the custom airspaces, the official ones, or both. The Airspaces Extension has many settings that influence how they are presented on the map, what alarms and alerts you will get, and when you get them. Play around with them to set them to your own preferences. But two settings we want to highlight here. Max controlled altitude is the altitude that an airspace lower limit must have, in order for the airspace to show up on the map. This is very practical to avoid cluttering the map with airspaces that you will never reach because they are too high. But make sure you don't set this value too low. If you happen to have brilliant flying conditions, you might get higher than you expect during your flight. Sea level air pressure (QNH) is important for Flight Level airspaces (FLxxx), and it should always be set to the local QNH value before each flight. FL airspace limits are based on the altitude that a barometric altitude aircraft instrument shows, when it is calibrated to the standard atmosphere pressure (1013.25 hPA). In general, this differs from the GPS altitude of the aircraft. 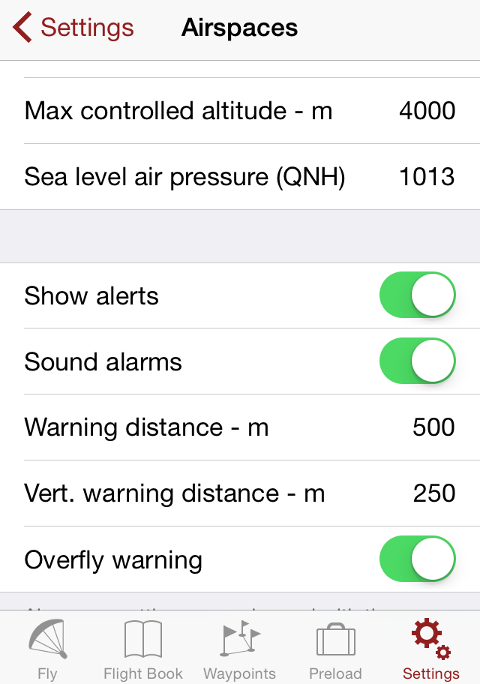 By setting the QNH parameter, Flyskyhy can calculate those altitudes from the GPS values. Note that if you fly with an iPhone-6(+), or with a Bluetooth vario, then the QNH is determined automatically from the pressure information, and you don't need to set the QNH parameter anymore. The airspace information may not be accurate or current and must not be solely relied upon for navigation and planning. No warranty of completeness, correctness, or fitness for any purpose is made or implied. Always consult the official publications for current and correct information. We always strive to keep the airspace information as up to date as possible. If you have updated airspace information or information about countries not on this list, please let us know with the contact form.